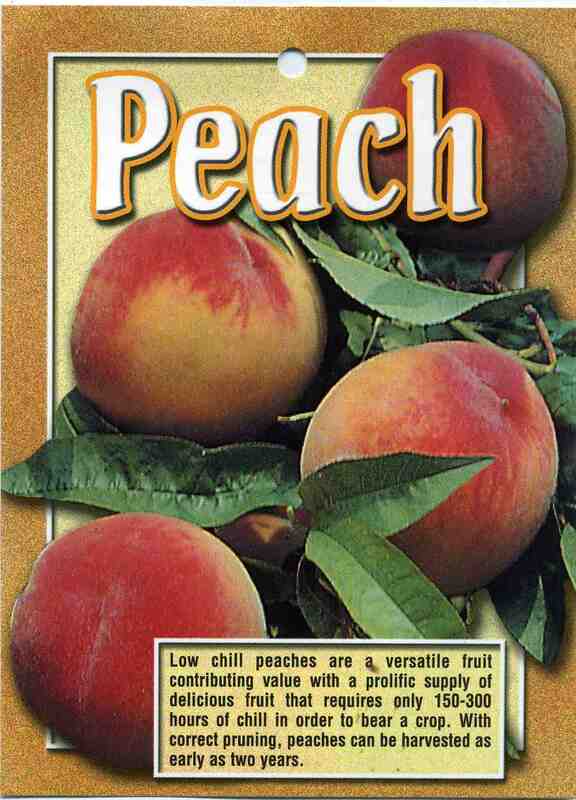 Low chill peaches are a versatile fruit contributing value with a prolific supply of delicious fruit that requires only 150-300 hours of chill in order to bear a crop. With correct pruning, peaches can be harvested as early as two years. 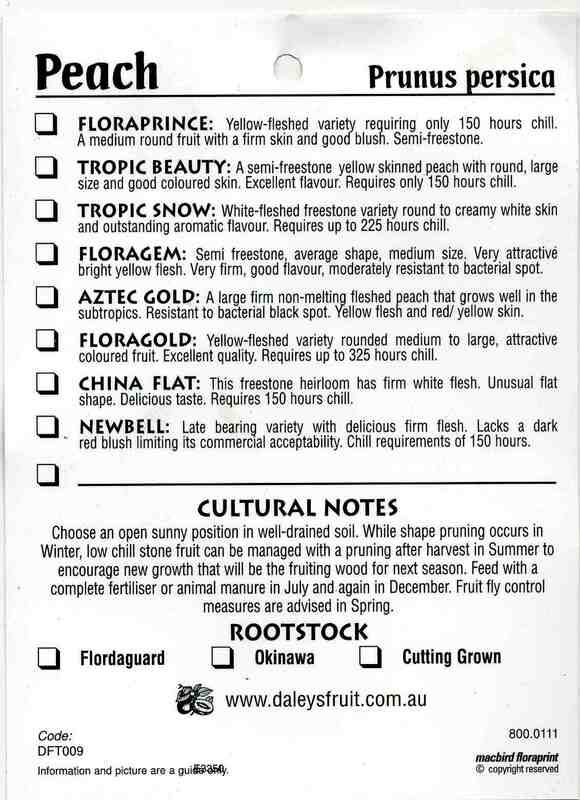 ﻿FLORAPRINCE: Yellow-fleshed variety requiring only 150 hours chill. A medium round fruit with a firm skin and good blush. Semi-freestone. TROPIC BEAUTY: A semi-freestone yellow skinned peach with round, large size and good coloured skin. Excellent flavour. Requires only 150 hours chill. TROPIC SNOW: White-fleshed freestone variety round to creamy white skin and outstanding aromatic flavour. Requires up to 225 hours chill. FLORAGEM: Semi freestone, average shape, medium size. Very attractive bright yellow flesh. Very firm, good flavour, moderately resistant to bacterial spot. AZTEC GOLD: A large firm non-melting fleshed peach that grows well in the subtropics. Resistant to bacterial black spot. Yellow flesh and red/ yellow skin. FLORAGOLD: Yellow-fleshed variety rounded medium to large, attractive coloured fruit. Excellent quality. Requires up to 325 hours chill. CHINA FLAT: This freestone heirloom has firm white flesh. Unusual flat shape. Delicious taste. Requires 150 hours chill. NEWBELL: Late bearing variety with delicious firm flesh. Lacks a dark red blush limiting its commercial acceptability. Chill requirements of 150 hours. Choose an open sunny position in well-drained soil. While shape pruning occurs in Winter, low chill stone fruit can be managed with a pruning after harvest in Summer to encourage new growth that will be the fruiting wood for next season. Feed with a complete fertiliser or animal manure in July and again in December. 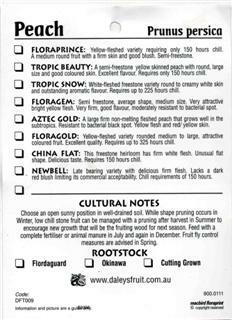 Fruit fly control measures are advised in Spring .